Is it crazy for ketchup to bring me such a smile? Honestly! I didn't know if I should name this delicacy “Oh My Lans Ketchup!”, “Mercy Sakes Ketchup!”, or “You Are Never Going to Believe It Ketchup!”. When I think about this delicious, simple, and nutritious condiment, I can only shake my head. Can you imagine encouraging your child to take a dip in ketchup? Who doesn't love to dip? 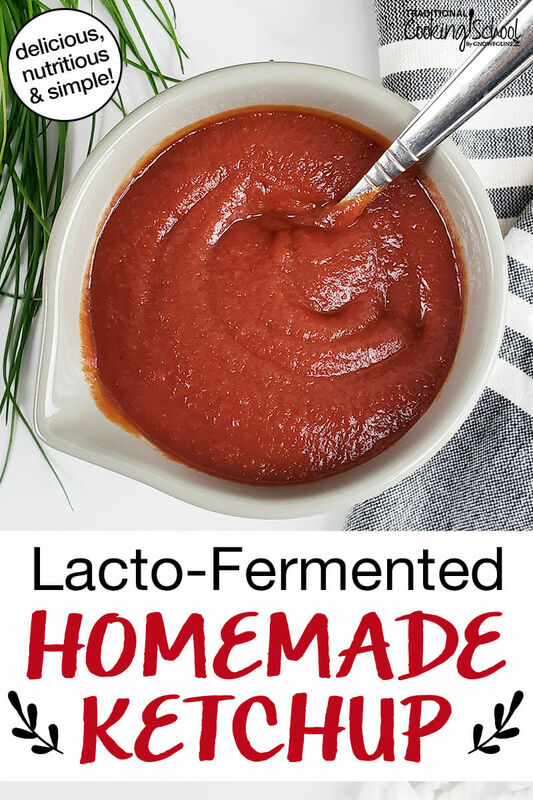 Enjoy the taste and tang of summer year round with this lacto-fermented treat -- homemade ketchup! *If using water instead of whey, increase sea salt to 3/4 teaspoon. In a medium sized bowl, whisk together all ingredients. Pour sauce into a storage container. Cover and leave at room temperature for 2 days. See also: lacto-fermented mayonnaise and honey-dill mustard, or 3 more fermented mustard recipes. Do you make your own homemade ketchup? Will you try lacto-fermenting it next time? This post was featured in 43 Fermented & Probiotic-Filled Condiments and 92 Nourishing Grill & Barbecue Dishes, Drinks, & Desserts. .-= Jana @ The Summer House´s last blog post… Fresh Navel Oranges =-. It’s lasted over a month in my house. I doubled the recipe but it’s still gone by then! Can I use powered goats milk whey instead of fresh whey? I can’t wait to try this. It looks delicious! Thanks for the recipe. .-= Stacy @ Delighting in the Days´s last blog post… Healthy Body = Happier Home =-. Fantastic! I can’t wait to make this one! All the other recipes I find have fish sauce in it and that is something that I don’t even think I’m quite ready to dig into! Actually I have made a to die for barbecue sauce with one of the ingredients being fish sauce. It was surprisingly good. Looks great, can’t wait to try this. I’m still looking for the perfect ketchup recipe. .-= Kat´s last blog post… Comment on The First Thing I Cooked by Tweets that mention Kat’s Food Blog » The First Thing I Cooked — Topsy.com =-. I have always made the recipe from NT and love it, but missed some of the spices that other ketchups have. This sounds like it will really fit the bill. To those who are unsure about using fish sauce – don’t worry, it does not lend a fishy taste to the finished product. It gives a depth of flavor and a bit of saltiness. It also is the source of the fifth taste – umami. I will make sure to add fish sauce when I make this ketchup recipe. I’m wondering about some substitutions. Honey for the maple syrup and sauerkraut juice for the whey. Any reason why those won’t work? Patty – I think those would be great substitutions. Go for it! .-= Kimarie´s last blog post… Sprouting Grains For a Large Family =-. Perfect timing! I’m almost out of ketchup. I’ve been making the NT recipe, but this sounds like it’s definitely worth a try. I’ll be using sorghum syrup in it. Kimarie and Kelly- I’d love to hear how you like the recipe. It’s an easy one to tweak if it’s not quite perfect for you the first time. Hope you enjoy it! Makes me want to go on a mission showing everyone how easy it is to make lovable homemade ketchup! Last summer I made a plum chutney that I have been using as ketchup all year. The original recipe came from The Cottage Smallholder but I wrote up my version on my blog. This looks like a super easy, great tomato ketchup.. I might try it soon! Thanks! Lacto-fermented, I would imagine this should last a good 2 months or more in the fridge…in the unlikely event you don’t finish it off well before then! THANK YOU ERIN!! I have been wanting to make my own ketchup for my daughter and have been hesitant cuz all recipies have whey in it. she can’t have it. 🙁 I am sooooo looking forward to trying this! Looks so easy! I’m definitely making this next week – I ordered some tomato paste from my co-op! yay! Malana- Oh, how I would love to have enough tomatoes from our garden to consider making tomato paste! I did a little looking for you and came across a great website. Looks like 5 lbs. of tomatoes will give you around 2 cups of paste. The process involves cooking the tomatoes, pushing them through a sieve, and finally slow baking the sauce in the oven to remove the water. Oh delicious! If you are overrun with tomatoes, give it a try! Danny, I’m assuming you seed the tomatoes and peel them before powdering them? Also how do you vaccum seal your glass canning jars? Thanks for the powdering tip. Thanks so much for the link about tomato paste. I’m certainly going to give it a try if we have a bountiful harvest. I can’t wait for my tomatoes to be ready!! THANK YOU for posting this! Question for you- how do you know the fermentation process has worked? Does it taste a little sour? I can’t have whey so will be using other things to kick off the fermentation process, and am just wondering how I will know when it has worked. Thoughts? Amy- The apple cider vinegar will also ferment the ketchup. Leaving it on the counter for three days should do the trick. And, to be honest, I don’t really know how you know if it is working. I just trust that it is (based on information in the Nourishing Traditions book and other fermented recipes I’ve read), but that isn’t a very good answer now, is it! 🙂 I know the ingredients are nourishing, and that fact alone makes me smile inside and out! Erin, You mentioned you will be going through PA this summer? We live near the Wilkes-Barre/Scranton area. Will you be close to me? So far our summer has been very good. everything green and gardens growing nicely. You can email me. Thanks. Just made this and it is truly delicious! I’m going to add it to my recipes in Springpad. My my my. This is good good good. This is officially my new ketchup recipe. I have always used the NT one, which was alright, but this is delicious! It hasn’t even fermented yet and I couldn’t even stop having little spoonfuls! What are your favourite places to use it? I bulk buy my tomato paste in a bout 5 pound containers, then freeze it in 1 1/2 cup portions (12 ounces). When ever my ketchup runs out, I pull my jar of paste out of the freezer, and make up a new batch. I just had the thought while making this, it would be SO much more time efficient to make up a massive batch of this ketchup when I first get the tomato paste, then freeze it. When I run out, I simply pull one out of the freezer already made, rather than making a new batch every time. Thanks for another stunning recipe Erin! Hi Lisa- It makes a little more than 2 cups. I usually fill my 2 cup ball jar and then have a little bit left over in a smaller jar. Enjoy! Ceitllyn – You can do a towel or a lid. I’d prefer a lid, since this lacto-fermentation happens without the presence of oxygen and there’s no need for air flow, which just introduces more organisms to settle on the top of the ketchup and possibly proliferate. Hi. Just a quick question about fermenting and what room temperature is best? I am finding that during the summer months it is too hot and my lacto fermented sauerkraut doesn’t turn out right. Does anyone have any info on this? I am thinking temps in the low 70’s is best but during the summer it gets in the 80’s in my kitchen. Any ideas on this? Thanks! 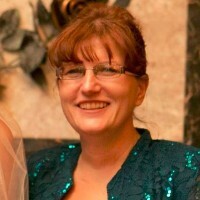 Janette — Best is right around room temp. Over 80 degrees and things go very fast. My ferments last weekend (during hot weather) were done in half the time. So 1-1/2 days instead of 3 days. Very fast! We were enjoying 100 degree weather outside and the house was almost as hot. So, if you have a hot kitchen, keep an eye out for mold (skim it off the top), and be prepared for things to be done soon. With something like ketchup, you won’t know it necessarily, like you would a pickle. I made this ketchup last weekend and since everything else was done fast, I considered the ketchup done too. I made this today & was very pleased with the taste. I have always enjoyed the NT recipe too and I am not a fish lover at all. I use half the amount of fish sauce called for, use water for the rest, and the taste is nice and not at all fishy. But this was great too! I think maybe next time adding some molasses, garlic and paprika or chilli powder might make a really good BBQ sauce…I will post if it works! I made this is the food processor as it mixed the honey in better. I was wondering if ACV can be used to sub for whey in other ferments too? I know it can when soaking grains; I didn’t realize that it was an option for ferments though.. This filled.maybe 5/8 of a quart sized jar,so I am guessing doubling it would be too much for producing a quart since you need the empty space at the top. Has anyone tried? I don’t know about the freezing idea mentioned above …wouldn’t it destroy the live enzymes/good stuff you are trying to create by doing the lacto-fermnting process? . Michelle- So glad you enjoyed the ketchup. Your comment, however, has pointed to a bit of editing I must do! Whey must be used in the ketchup if you want it to be lacto-fermented. You may omit it, but then you would not reap those benefits. The ACV is added for taste. I’m sorry if that was confusing. Your BBQ sauce idea sounds amazing. I have yet to give that a try. Please let us know how it goes. Delish! OK, so it is lacto-fermented with the ACV and the whey but would not be if you used just the ACV and water, right? Yes. The whey does the work. You could leave the ACV out completely, use the whey, and have a deliciously nutritious lacto-fermented condiment! 🙂 Enjoy! By tomato paste do you mean raw tomatoes blended and pureed or did you make the paste by cooking the tomatoes first? Mala- I purchased organic, no salt added tomato paste from the store. If you want to use your own tomatoes, you have to go through the process of cooking them down first. Check out this recipe as an example or the many others on the web. Good luck and enjoy the ketchup! Wow I appreciate your prompt reply, thanks. I couldn’t find the link for the tomato paste recipe in your reply though. Would it suffice to simply steam, puree the tomatoes, pass it through a coarse filter, and then cook down the puree again to ketchup consistency, then cool it and carry on with the recipe to make ketchup? Mala, sorry about that! Here are the links. One recipe cooks down the tomatoes on the stovetop, the other cooks down the tomatoes in the oven. With either method, you will end up with delicious, fresh homemade tomato paste. Enjoy! Monica, whey is needed for lacto-fermentation in this kind of recipe. However, it is easy to get whey. Just hang plain yogurt (with live cultures) in a cheese cloth for about 8 hours. The yellowish liquid that drains out is whey, and it stores in the fridge for about 6 months. What’s left in the cloth is yogurt cheese, which can be salted and eaten like cream cheese (I add chives, too). How long will it stay good for? Holly — I had some last 6 months and it was still good for longer I am sure. It wasn’t opened very often at the back of the fridge. Opening it more will reduce the storage time. To the person who wanted to know if there’s an alternative to whey: I’ve used the juice from home make sauerkraut to lactoferment lots of savory recipes. It’s perfect for ketchup. Delish. Thanks that what I needed to know since I don’t like whey! Happy fermenting! oooh, that does sound yummy. thank you. I am not up on what can make something probiotic, so would that also make the ketchup probiotic? That sounds wonderful. I don’t always like the flavor of whey and I do love the fermented cabbage juice Idea. I can’t wait to try this sounds fantastic! Thanks for suggesting it! Monica the whey contains bacteria from the fermentation of the milk when making cheese or yogurt. When you put this into the mix the bacteria will reproduce making the ketchup come alive with this healthy bacteria, hence the probiotic nature. cant wait to try this. ive got my yougert hanging right now. I’m excited to find this recipe for lacto-fermented ketchup. However, I was surprised that you can lacto-ferment something which has been cooked first. The lactic acid-producing bacteria survive the cooking process O.K.? It is the whey and salt which preserves it, and it gets new, live lactic-acid producing bacteria from the air, our hands, and/or??? ! Thanks for your responses! Thanks so much for the reply. When you say whey or a non-dairy starter culture, does raw ACV count? Julie — No, you can’t use raw ACV. It’s the wrong culture for this kind of fermentation. Well, having said that, you could probably do it but it wouldn’t be lacto-fermented, it would be more vinegar-fermented. Thanks for this recipe – it sounds yummy! Question…. if I use water instead of whey, do I need to add more salt or add some type of culture? Chana — Double the salt or use a non-whey culture (not both). I just put some ketchup out to ferment. I started with the NourishingTraditions recipe, but tweeked it quite a bit with a little apple cider vinegar and cloves, garlic and onion powder, but was still wondering what it was missing. Next time, I’m trying this one! Thank you for letting me know so quickly! Also do you make your Kefir with grains or from the powder? I noticed that yours is so much thicker than mine, I use the grains. What part of the Kefir are you talking about here? Can you put the whole grain in? Do you still add the salt? i made this last week, used a recipe from cultures for health which said to sit out for 3-5 days. My hubby put it in the fridge after the right amount of time since I had to go out of town. I got home and tasted it today and what started outta sting like my grandma’s homemade ketchup before fermentation now tastes like home-brew…. :(. Any hints for what to do different next time???? Did you get an answer about the “homebrew” taste of your ketchup? From my experience as a home brewer it is necessary for containers used for fermentation to be spotless. This is not to suggest the container you used was dirty but there are wild yeasts and bacteria floating around all over (think about how sour dough starter is made). It is possible that your ketchup was “infected” with some wild yeast and that resulted in the off taste.. This is THE BEST ketchup ever!!! 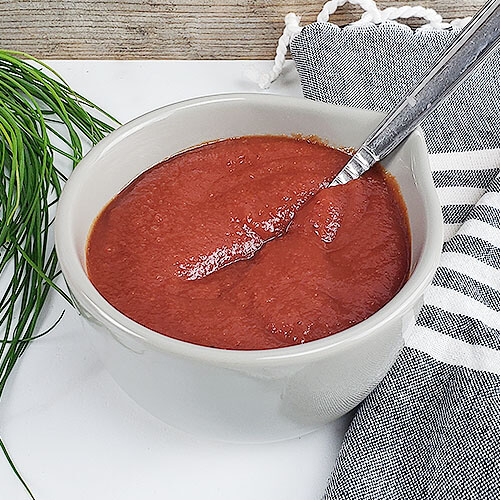 I can hardly make and ferment it fast enough for my girls, to whom ketchup is a major food group onto its own – but with this recipe, I don’t mind! Thank you for sharing your recipe! P.s.- cant wait to try this recipe! Hi Esther! No, no blog as of the moment. 🙂 Thanks for asking! Hope you enjoy the recipe and your learning about Alaska. It is a most wonderful state (filled with many farmers and some very large produce!). For a newbie, can someone tell me where I can get whey? I’m sure it’s not the whey powder you use in smoothies, is it? Just a question, do I burp the container during the two days? Can I use rejuvelac or coconut water kefir instead of whey? This probably a silly question, but can I use a store-bought organic ketchup and just add whey or another culture to it and allow it to ferment on the counter in a mason jar? How about store-bought salsa? Also, I was wondering if you can ferment frozen vegetables like asparagus and cauliflower. What can I say? I’m a sucker for a shortcut. Mary, good question. I don’t see why you couldn’t use that shortcut, provided there were no preservatives (such as potassium sorbate) added. But really, is it so easy to make! If you do make it, you can also keep out ingredients such as “natural flavoring”, which is just another name for MSG. We have been searching for a homemade ketchup for a while and we keep coming back to this one. I’ve even sent a few friends this way for the recipe. Thank you! Do you know if a vinegary kombucha tea could be used instead of the ACV? Would it make a problem combining with the cultures in the whey? Thanks. What is the purpose of the vinegar? Is it for taste or does it adjust the ph of the ferment correctly, until the bacteria gets jump started. Hi there Sue- Feel free to use your kombucha instead of the vinegar and even instead of the whey. Kombucha would do a great job of fermenting your ketchup. Just a matter of your taste preference! So for the whey I can just use whey protein powder? Is that right? Hi Beth- I believe this recipe makes just a little over a pint size jar amount. Hope you enjoy it! Could I use the fermented juice from my Bubbies pickles? Would that give me the same lacto fermentation? Is this supposed to be tightly covered while it ferment or just keep-the-bugs-out covered? Hi there Emilie- Go ahead and put a lid on it. Enjoy! I am trying to lacto-fermented ketchup right now, it has been sitting on my counter for 3 days but I don’t see any bubbles forming. Does this mean that it is not working? Hi Melissa~ Sounds to me like your ketchup is ready to be popped in the fridge. Don’t worry if you don’t find bubbles. If you used active whey, you should be all set! Enjoy! How about adding raw onion juice? Would that compromise the bacteria? I figure you can do it with salsa… I just tried it and so far the taste is excellent! This looks delicious! How much does fermenting the ketchup change the flavor of it? Will it still have a subtle sweetness to it like it does normally? Thank you for sharing this recipe! I really want to make my own fermented ketchup at home! Not sure if this post is still active since most comes from 2012. I’m trying to eliminate sugars – can I use stevia instead of the maple syrup/honey? My kids proclaimed this “the BEST ketchup EVER!” and that’s saying something, cuz they came straight from French’s store bought! I added about 1T molasses, and used 1T whey, 1T kombucha (because the Greek yogurt I had didn’t want to give up any whey!) but otherwise followed the recipe. I let it ferment for 2.5 days because our house is cold in the winter! (And other ferments take longer than recipes say.) Will definitely make again! Thanks for the recipe! Hello! Thank you for the recipe, so easy! I was wondering if it is suitable during pregnancy, please?